6 P R I N T W E A R M A R C H 2 0 1 9 BUSINESS WATCH Stay up to date with what's happening in the world of apparel decorating and news relevant to your business. 6 P R I N T W E A R M A R C H 2 0 1 9 6 P R I N T W E A R M A R C H 2 0 1 9 Equipment Zone Opens Doors on Epson Certified Solution Center LONG BEACH, Calif.—Equipment Zone opens doors on its Epson Certified Solution Center. The center is inside of Equipment Zone headquarters in Franklin Lakes, New Jersey. With the certification, the New Jersey-based facility offers print samples and applications, customer training, and a full line of Epson production equipment demonstrations. "We want to encourage customers to create an innovative project with confi- dence and are thrilled to partner with Equipment Zone to create this unique Epson experience," says John Meyer, manager of Epson America's Wide Format Chan- nel. "These Epson Certified Solution Centers are designed to showcase the depth of capabilities that Epson has to offer, as well as allow customers to realize the full potential of partnering with Epson." Epson selected Equipment Zone in the Fall of 2018 as part of its rollout of na- tionwide Solution Centers, and the office subsequently hosted an expo to introduce visitors to its offerings. "By providing access to this technology, we've been able to host the first annual Epson Expo, an event that provided our customers in the New Jersey and New York City area a chance to experience the full range of Epson professional solutions," says Harry Oster, president of Equipment Zone. "We are looking forward to con- tinuing to host similar Epson events in the years to come." 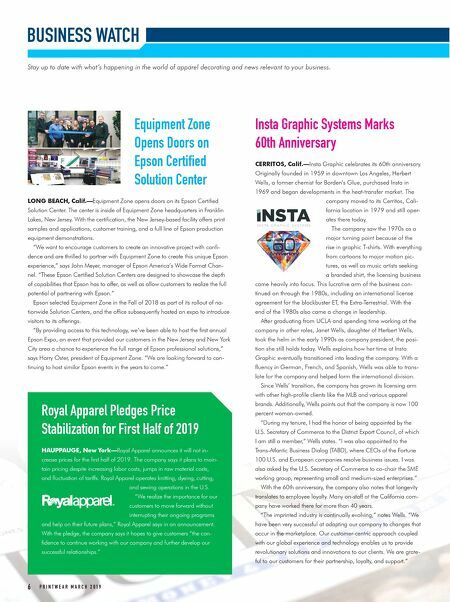 Royal Apparel Pledges Price Stabilization for First Half of 2019 HAUPPAUGE, New York—Royal Apparel announces it will not in- crease prices for the first half of 2019. The company says it plans to main- tain pricing despite increasing labor costs, jumps in raw material costs, and fluctuation of tariffs. Royal Apparel operates knitting, dyeing, cutting, and sewing operations in the U.S. "We realize the importance for our customers to move forward without interrupting their ongoing programs and help on their future plans," Royal Apparel says in an announcement. With the pledge, the company says it hopes to give customers "the con- fidence to continue working with our company and further develop our successful relationships." Insta Graphic Systems Marks 60th Anniversary CERRITOS, Calif.—Insta Graphic celebrates its 60th anniversary. Originally founded in 1959 in downtown Los Angeles, Herbert Wells, a former chemist for Borden's Glue, purchased Insta in 1969 and began developments in the heat-transfer market. The company moved to its Cerritos, Cali- fornia location in 1979 and still oper- ates there today. The company saw the 1970s as a major turning point because of the rise in graphic T-shirts. With everything from cartoons to major motion pic- tures, as well as music artists seeking a branded shirt, the licensing business came heavily into focus. This lucrative arm of the business con- tinued on through the 1980s, including an international license agreement for the blockbuster ET, the Extra-Terrestrial. With the end of the 1980s also came a change in leadership. After graduating from UCLA and spending time working at the company in other roles, Janet Wells, daughter of Herbert Wells, took the helm in the early 1990s as company president, the posi- tion she still holds today. Wells explains how her time at Insta Graphic eventually transitioned into leading the company. With a fluency in German, French, and Spanish, Wells was able to trans- late for the company and helped form the international division. Since Wells' transition, the company has grown its licensing arm with other high-profile clients like the MLB and various apparel brands. Additionally, Wells points out that the company is now 100 percent woman-owned. "During my tenure, I had the honor of being appointed by the U.S. Secretary of Commerce to the District Export Council, of which I am still a member," Wells states. "I was also appointed to the Trans-Atlantic Business Dialog (TABD), where CEOs of the Fortune 100 U.S. and European companies resolve business issues. I was also asked by the U.S. Secretary of Commerce to co-chair the SME working group, representing small and medium-sized enterprises." With the 60th anniversary, the company also notes that longevity translates to employee loyalty. Many on-staff at the California com- pany have worked there for more than 40 years. "The imprinted industry is continually evolving," notes Wells. "We have been very successful at adapting our company to changes that occur in the marketplace. Our customer-centric approach coupled with our global experience and technology enables us to provide revolutionary solutions and innovations to our clients. We are grate- ful to our customers for their partnership, loyalty, and support."